Collaborative Solutions can help you plan and execute your finance transformation. With over a dozen years of helping organizations align, transform and optimize their finance and accounting functions with world-class technology solutions, we are your trusted partner for helping drive modernization in the cloud. Workday’s powerful financial management system brings your accounting, consolidation, planning, procurement, projects, reporting, and analytics into one unified platform. Leveraging this best-of-breed solution, we help customers trade complicated spreadsheets for powerful and intuitive financial and analytics tools. Employing innovative technology, our customers can operate seamlessly and draw on valuable insights to help make the decisions that allow their organizations to be agile and proactive. Collaborative Solutions leads your finance transformation with Workday experts who understand your unique challenges and work with you to maximize business outcomes. 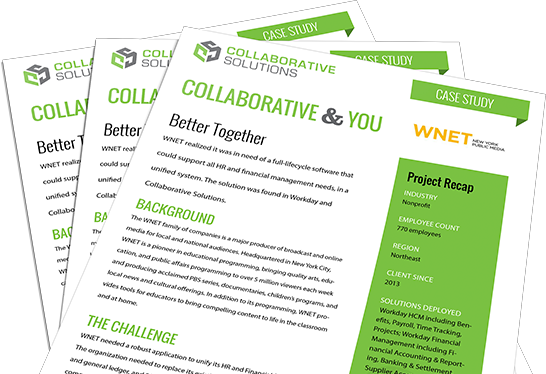 WNET needed a single, unified system of record for its finance and HR functions. They chose Workday to unify their finance and HR systems and selected Collaborative Solutions to lead the phased deployment. Ready to start your Finance transformation?